A two-week investigation by The Hustle's Zachary Crockett into the seedy underbelly of Amazon's "fake review economy" reveals rampant fraud - primarily from shady Chinese sellers bribing buyers for positive reviews. “Isn’t this illegal?” I found myself typing one Tuesday night at 1:15 AM. I looked up her product on Amazon: It was one of the highest-ranked iPhone chargers, touting 3,971 5-star reviews and a trusted “Amazon’s Choice” label. Crockett notes that while 82% of American adults check product reviews prior to making a purchase, just 65% of people trust them. Meanwhile, most people are swayed by the stars alone - vs. actually reading what people write about a product. 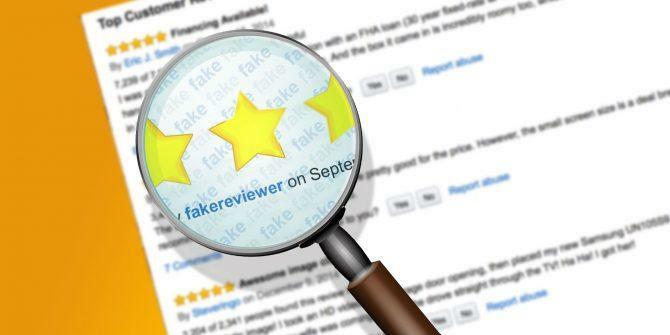 "The way Amazon presents reviews to you is a form of hypnosis," says Saoud Khalifah of fake-review detection site, Fakespot. "They put a glowing 5-star review right in your face. They program you to trust these stars." According to e-commerce metrics firm Feedback Express - 1.8 million vendors and sellers generate around 9.6 million product reviews every month on inventories of nearly 600m items. 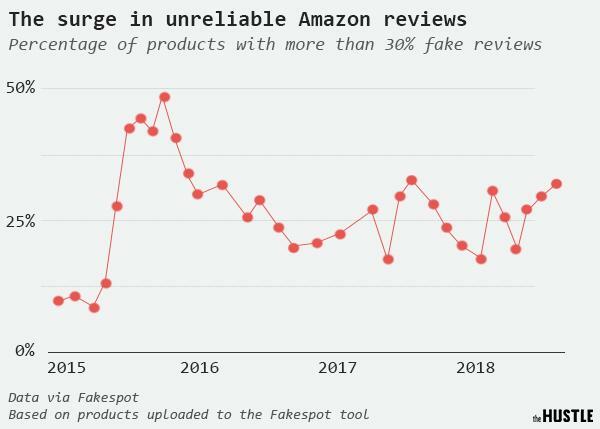 Fake reviews have been an issue for Amazon since its inception, but the problem appears to have intensified in 2015, when Amazon.com began to court Chinese sellers. The decision has led to a flood of new products — a 33% increase, by some accounts — sold by hundreds of thousands of new sellers. Rooted in manufacturing hubs like Guangzhou and Shenzhen, they use Amazon’s fulfillment program, FBA, to send large shipments of electronic goods directly to Amazon warehouses in the US. "It’s a lot harder to sell on Amazon than it was 2 or 3 years ago" says ex-Amazon manager Fahim Naim. "So a lot of sellers are trying to find shortcuts." Los Angeles-based vendor Steve Lee says "You have to play the game to sell now," adding "And that game is cheating and breaking the law." 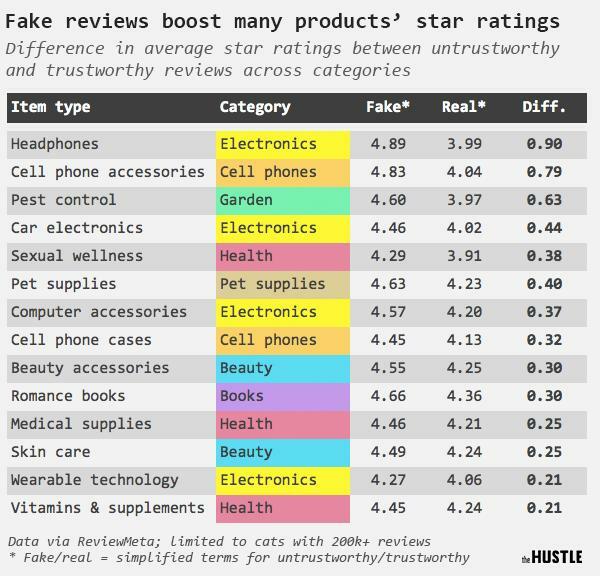 Another website tracking fake Amazon reviews, ReviewMeta, was founded by bodybuilder Tommy Noonan - who noticed what appeared to be a gamed product while shopping for testosterone boosters. "This product had 580 reviews and every single one was 5-stars," recalls Noonan. "People would write things like, ‘I haven’t tried this product…BUT,’ then leave a glowing review." 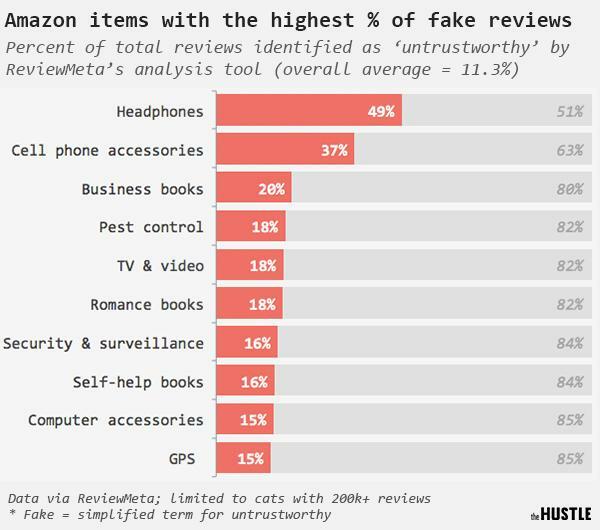 ReviewMeta has analyzed 203 AMazon reviews and found 11.3% of them (22.8m) to be untrustworthy. Review site Fakespot places the figure at around 30%. 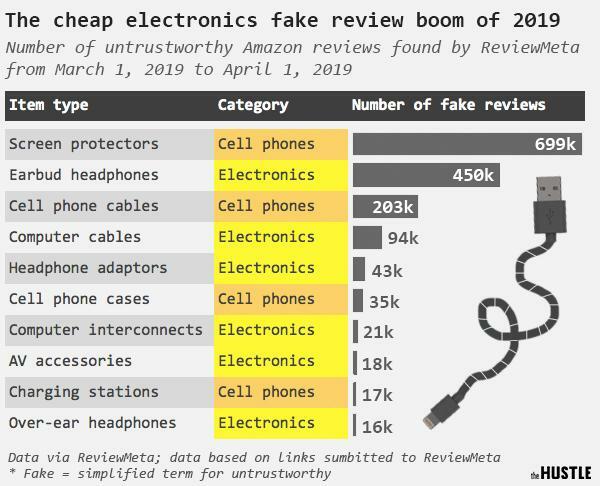 Amazon, meanwhile says that "less than 1%" of its reviews are fake, and has cautioned against trusting the review sites. "They’re almost all for these off-brand, cheap electronic products: Phone chargers, headphones, cables," says Noonan. "Generic things that are super cheap to manufacture, have good margins, and get a ton of searches." 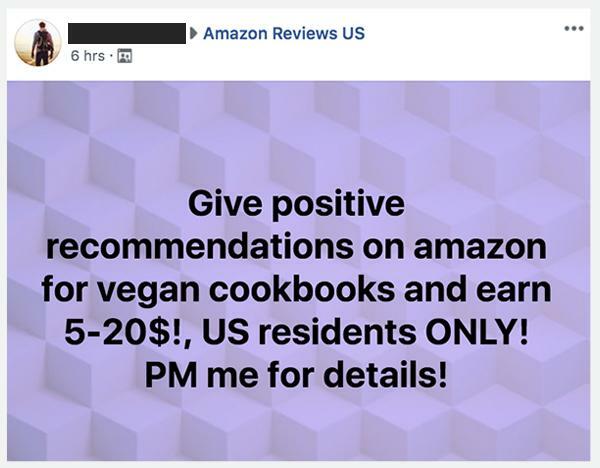 Under federal law, bribing people for reviews is illegal. "Endorsements are required to be truthful" says FTC Associate Director of Advertising Practices, Mary Engel. "If a reviewer has received something of value in exchange for their opinion, they need to clearly disclose that in the review." Crockett's journey into the seedy underbelly of fake Amazon reviews turned up over 150 private Facebook groups where sellers openly exchange free products (and in many cases, commissions) for 5-star reviews. "A sampling of 20 groups I analyzed [which I’ve posted publicly here] collectively have more than 200,000 members. These groups seem to be in the midst of an online Gold Rush: Most are less than a year old, and in the past 30 days have attracted more than 50,000 new users," according to the report. An interested buyer sends the seller a private message. The seller directs the buyer to the product on Amazon using keywords. The buyer purchases the product and leaves a 5-star review. The seller sends the buyer a refund via PayPal, plus a commission (usually in the form of a $5-10 gift card). He instructed me to search for the keywords “cycling shorts men” on the Amazon mobile app, gave me the first two letters of the brand name (XG), and said it was the 80th result. On the third page, I found the shorts: 32 5-star reviews — all unverified. "Make sure your reviews don’t sound overly fake and make sure you review other items too, not just from Chinese sellers," cautioned Araceli Morales - who has left 112 5-star reviews for Amazon sellers via Facebook listings. "Never write 'love'" be continued. One stay-at-home mom from Kentucky says she makes $200 - $300 per month leaving fake reviews. "Do you actually like the products?" asked Crockett. "I don’t know," she wrote. "I never use them." The sellers hope that the stars gained by taking a loss will build their credibility with unsuspecting buyers down the road. 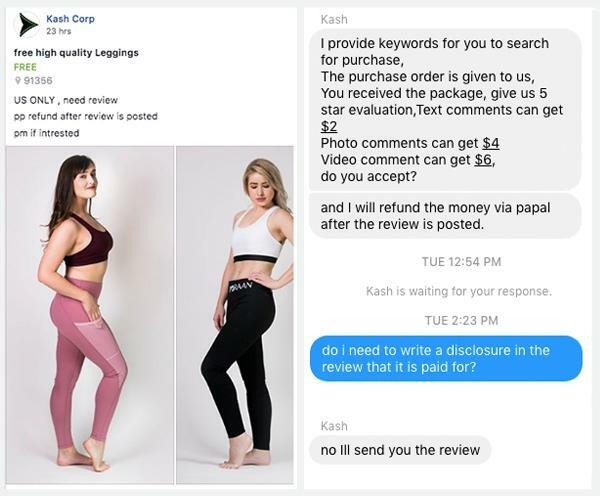 "It’s part of a promotion…it’s a long-term process," says Kash Corp - a seller of hot pink women's leggings that offered Crockett a $6 commission for a pre-written review - despite the fact that he's a man. When confronted, the sellers defended their actions. "Hear me out," said one seller named Mikaela. "We are doing this [to] help our item make sales. We are competing with thousands of screen protectors out there." Uh , yeah , I can fortell that . "My Wallmart lawn mower run perfect!" Finest capitalists in China. The product will perform in hot or cold environment. There is never dissatisfaction in using under all circumstance. Never expect such quality. It makes me lol when people buy something for $1 with free shipping from China and are surprised it was half the size pictured and doesn't even work. "WHY DID MY $3 LAPTOP CHARGER CATCH ON FIRE AND FRY MY LAPTOP?!" I don't consider the great reviews when making a purchase. I expect the item to be good and don't want to read all the people that like it. I go straight to the one star reviews. I look at what every dissatisfied person says. If there are many and they all have the same problem I don't purchase. If a person is complaining because they lack the talent to assemble or use the item, I disregard it. My favorite thing on Amazon is reading seller reviews, but people leave product reviews instead, and give the seller 1 star because the movie sucked or something, lol. Was looking at a product recently that had all 5 star reviews. Maybe 20 of them. Every single one was formatted in the same way, with the same bad English, and a stereotypical made up name. There were no real reviews. Seems to be the norm on a lot of products on Amazon these days. It’s also nice a nice touch when they add a badge or text to their main picture that says “Best Seller” or “Amazon Favorite”. Correct . No sympathy for these skinflints . They probably use Ali Baba when nobody is looking . Last edited by oyarde; 04-16-2019 at 09:45 AM. I read reviews not for raves but what people say are possible problems with the item. And see if multiple people report the same thing and decide if that problem is something which would matter or not to me. Reviews of products may be fake, they may be people excited about their new purchase and haven't actually used it much yet or may be just trying to publicly justify their purchases.